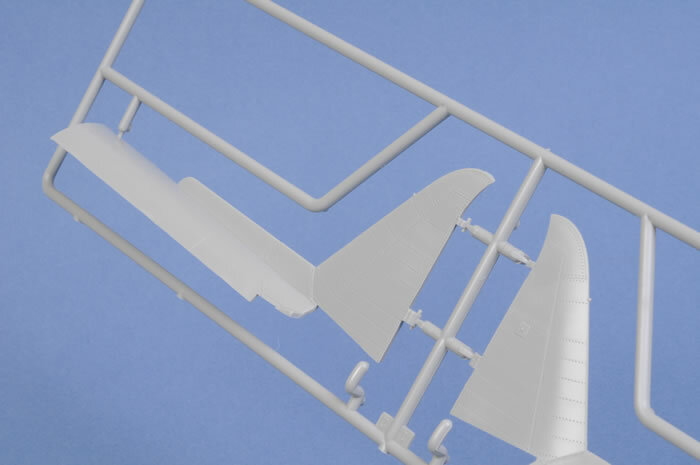 Advantages: High quality mouldings; remarkable level of detail including full engine, supercharger, ducting and wing armament; optional position slats, flaps and flying surfaces (but no metal hinges); surface features include finely recessed panel lines, and fastener detail; thin, clear transparent parts; options include ample weapons and drop tanks. Disadvantages: Canopy shape not quite right; no blast tubes for wing machine guns; corrugated cockpit floor is for an early P-47D; mis-spelt decals. 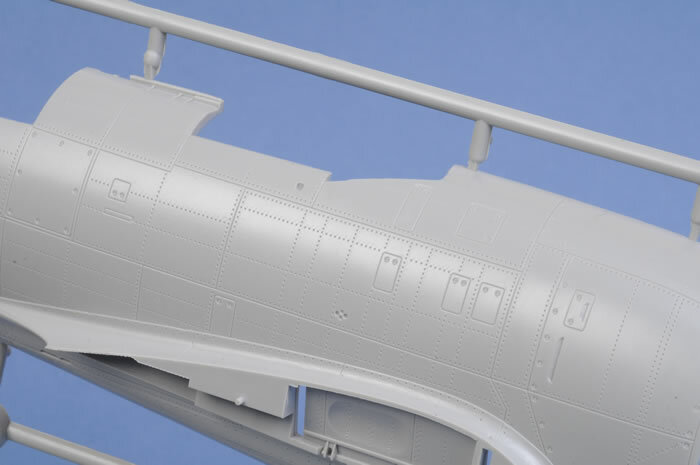 Conclusion: The kit displays some shortcomings but most can be addressed fairly easily, and it is still the best mainstream P-47N available in any scale. 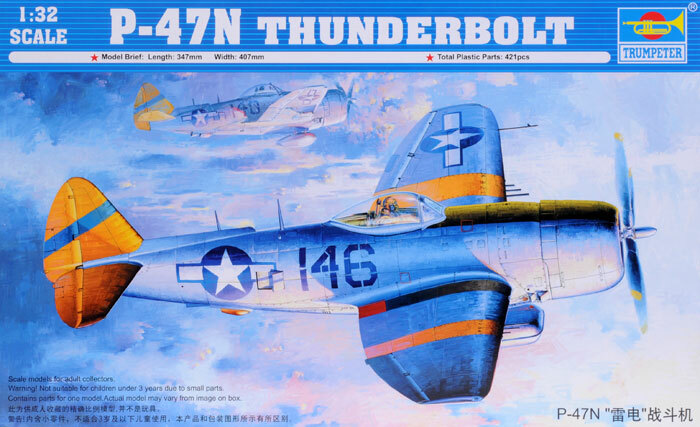 Trumpeter's latest addition to their big Jug family in 1/32 scale is the ultimate Thunderbolt, the P-47N. 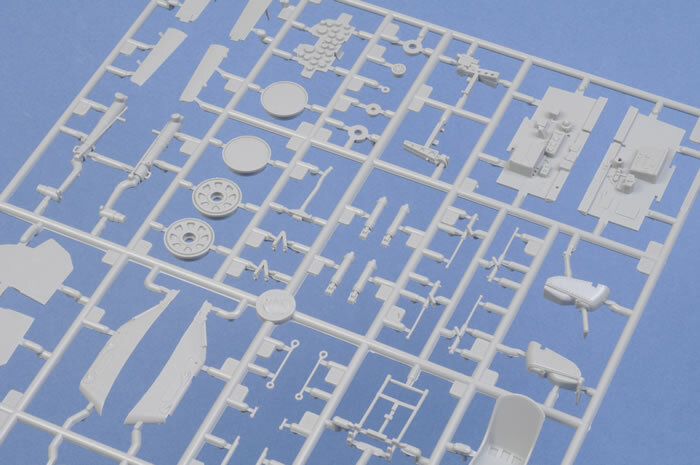 Trumpeter's 1/32 scale P-47N Thunderbolt comprises around 400 parts in light grey plastic; 21 parts in clear; two vinyl tyres; soft vinyl machine gun ammunition belts; one photo-etched fret; acetate film for instruments and markings for three aircraft. 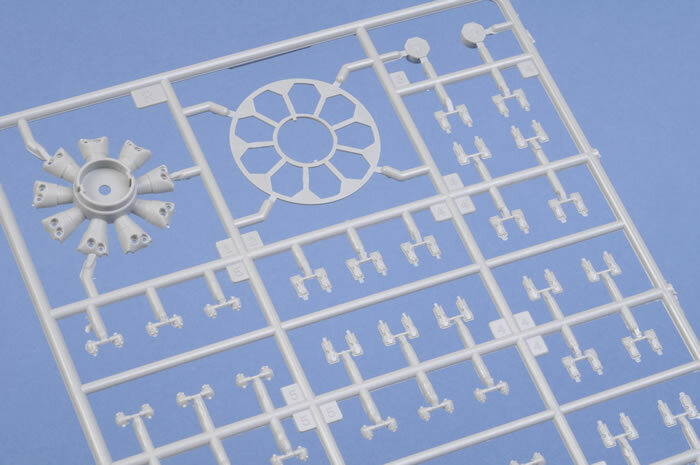 The plastic parts are very well moulded. Exterior surfaces feature crisp, fine recessed panel lines plus rows of recessed rivtes. These rivets are a matter of personal taste (and the centre of controversy), but they are at their most subtle on this model. 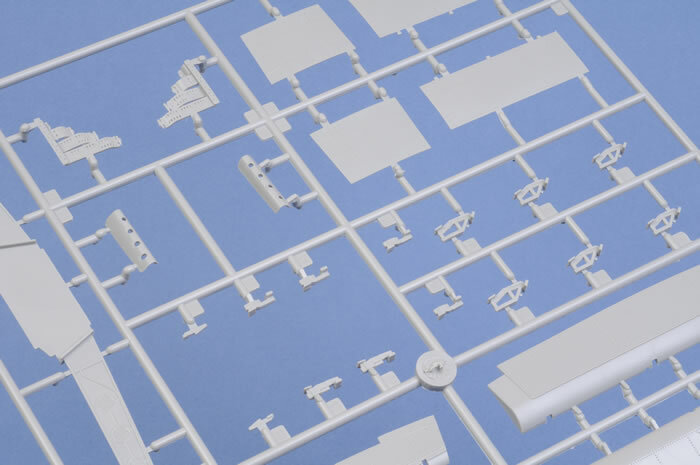 The most striking feature of this model is the vast amount of interior detail. In addition to a very complete Pratt and Whitney R2800 engine, this model boasts comprehensive interior detail such as the entire supercharger assembly plus all the ducting from stem to stern, oil tanks, radiators and more. The wings don't miss out on the detail party either. 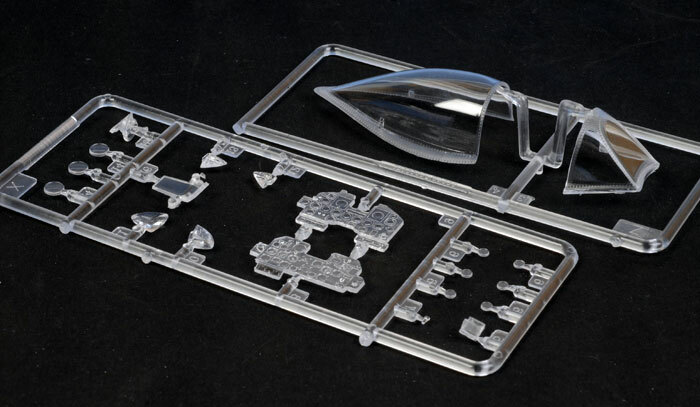 The gun bays are supplied complete with soft vinyl ammunition belts for the ammo trays. 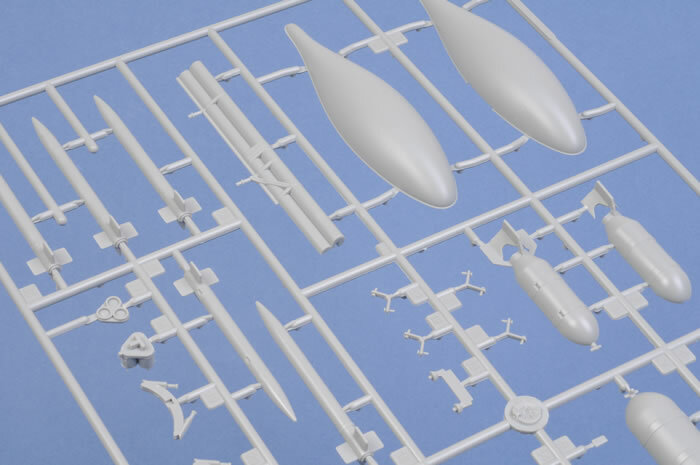 Trumpeter has depicted the machine gun barrels directly poking from the forward gun fairings, but these should actually be plain chrome blast tubes. It will be a simple matter to replace the front of the gun barrels with plastic or metal tubing. 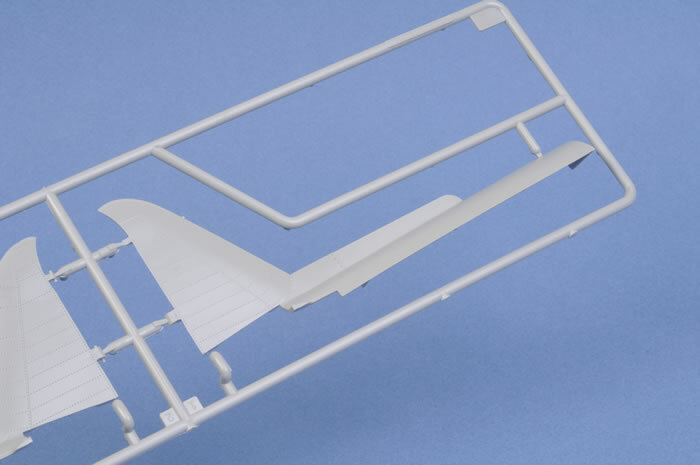 The cockpit is also well detailed but some aspects are inappropriately left over from Trumpeter's initial early P-47D. The most obvious example is the corrugated kit floor. Late Ds and all Ns featured a flat floor. Later P-47Ns (from the N-15 onward) were also fitted with arm rests on the pilot's seat. 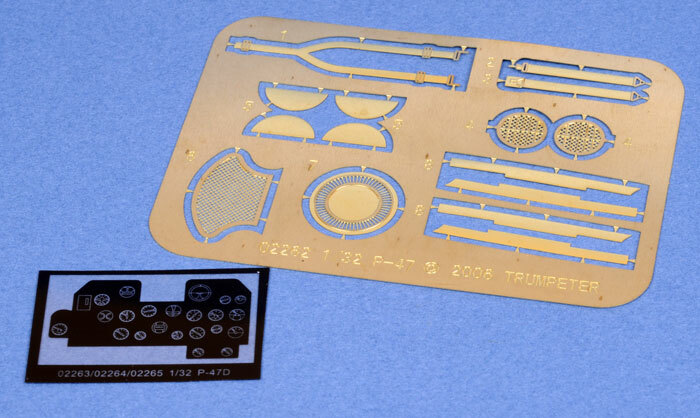 Photo-etched parts include vents and harness straps. 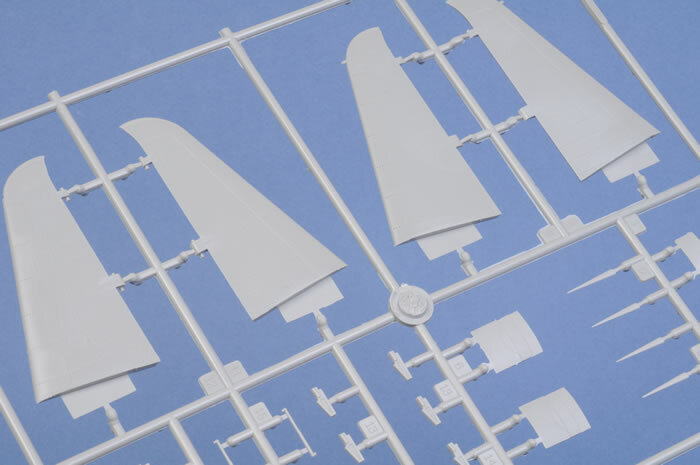 Control surfaces are separate, and may be positioned to the modellers preferences. 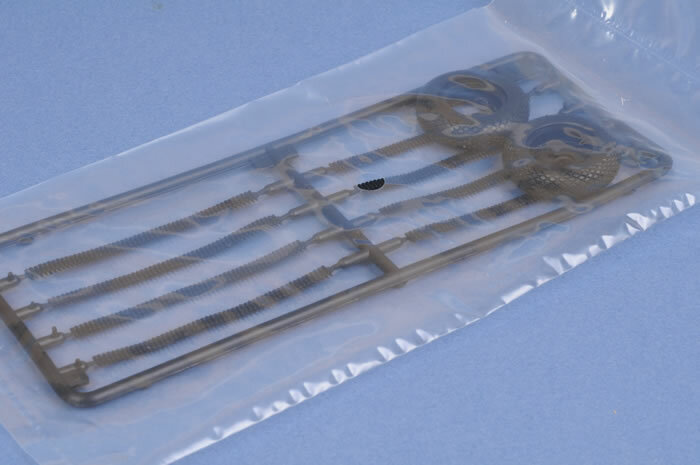 Optional hinges are supplied for raised or dropped flaps. The wings are all-new, correctly depciting the wider wing span and relocated wheel wells. They also feature the late style of rocket stubs. The fin fillet is the late style seen on the P-47N. 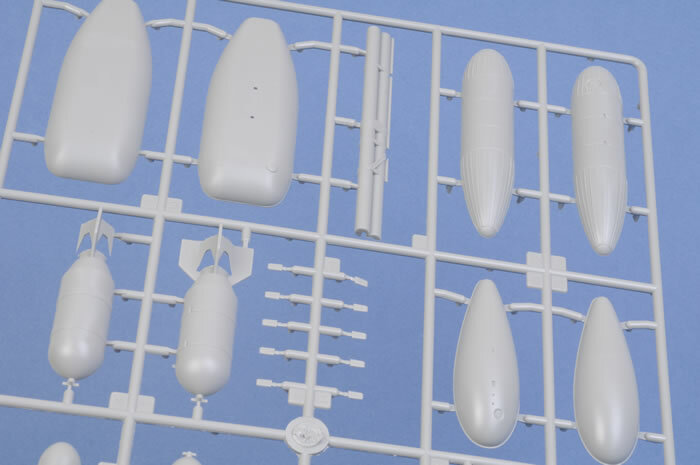 This is an insert for the top of the fuselage, moulded with the vertical tail and a section of upper fuselage. The option of open or closed cowl flaps is offered. 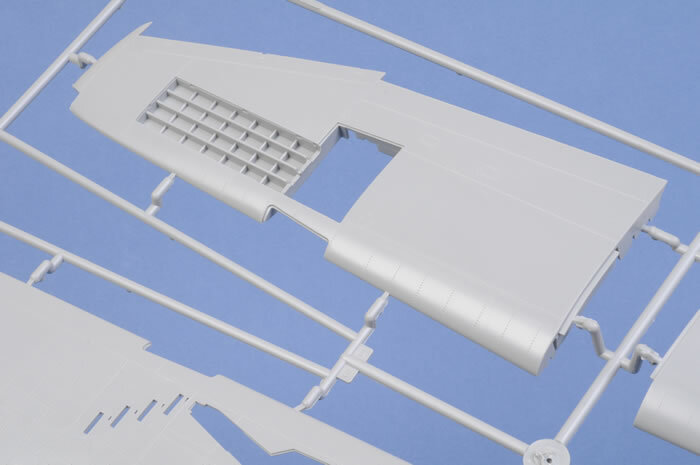 The entire flap assemblies are thoughtfully moulded in one piece each. 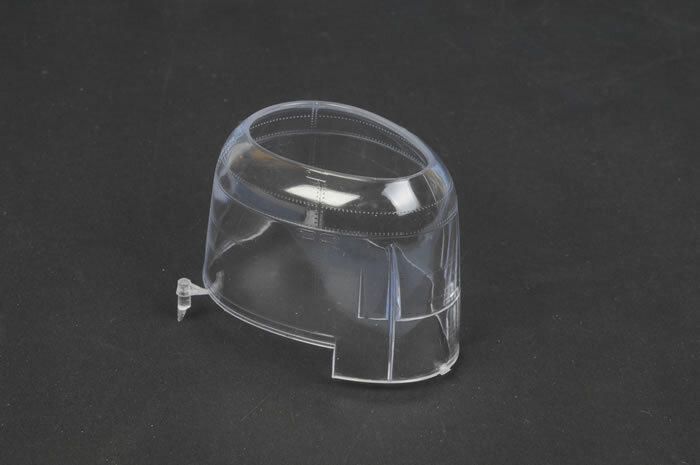 The engine cowl itself is moulded in clear in the event that you want to expose all the hard work you have done on the engine. A stack of ordnance is provided, including Lockheed-style drop tanks, flat drop tanks, paper drop tanks and 75 gallon metal drop tanks. Weapons include ten rockets, two 250 lb bombs and two 500 lb bombs. 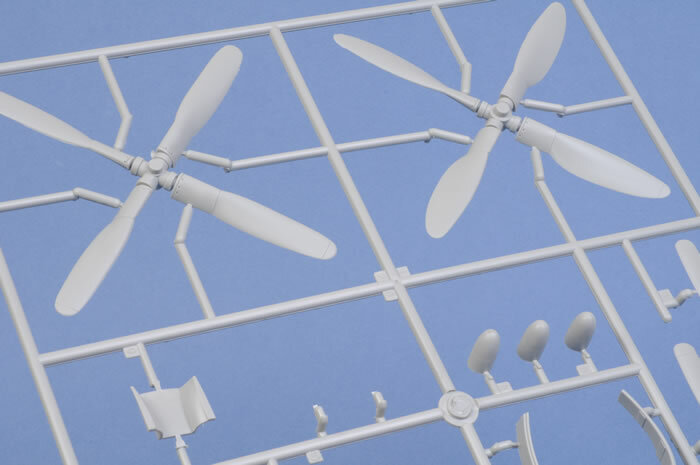 All four styles of propeller blades are included, but you should only need the Curtiss Electric asymmetrical paddle props. The clear parts are thin and crystal clear. 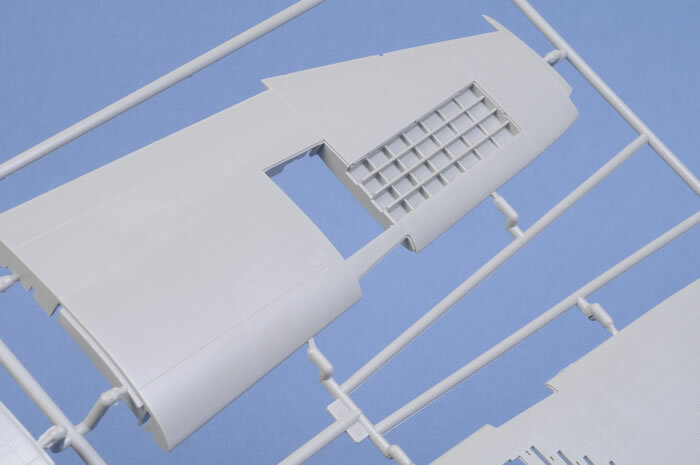 The shape of the windcreen and sliding canopy section does not look quite right though - perhaps a bit too much of a "teardrop" shape on the sliding section in particular. "2 Big And Too HEAVY" / "Short Snorter". Unfortunately, we have another mis-spelling here with the large letters on the starboard side of the cowl reading "SNDRT SNDRTER" instead of SHORT SNORTER. 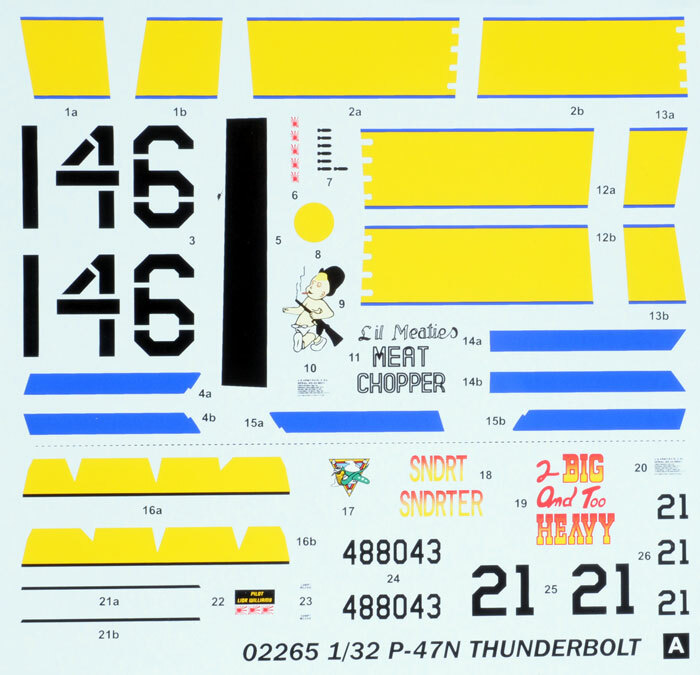 Luckily, the correct markings are available on an after-market decal sheet from Zotz. The decals are in good register. 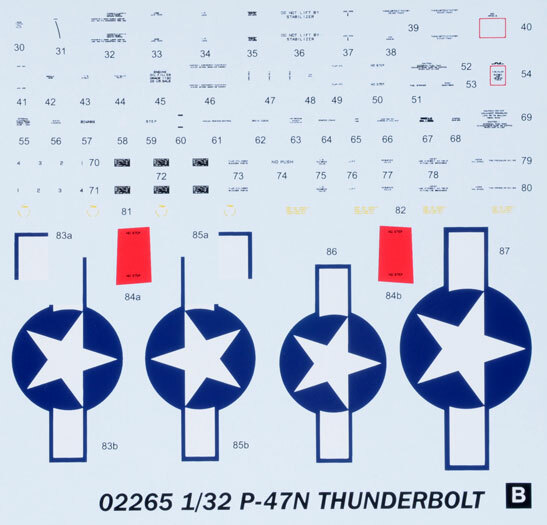 The nose art girls are supplied on a smaller separate sheet. 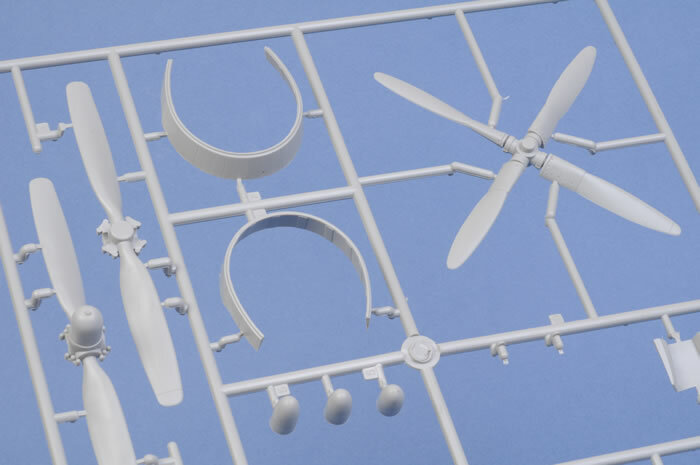 Trumpeter's 1/32 scale P-47N Thunderbolt is a remarkably well detailed kit. 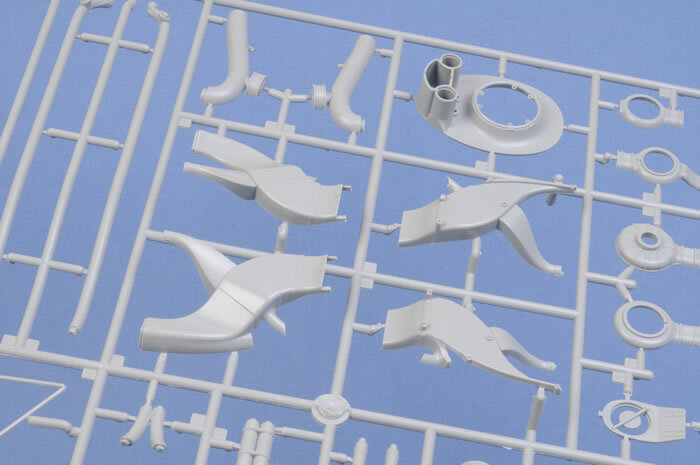 Trumpeter has clearly also taken notice of earlier comments, as the kit engineering is quite straightforward despite the large number of parts. 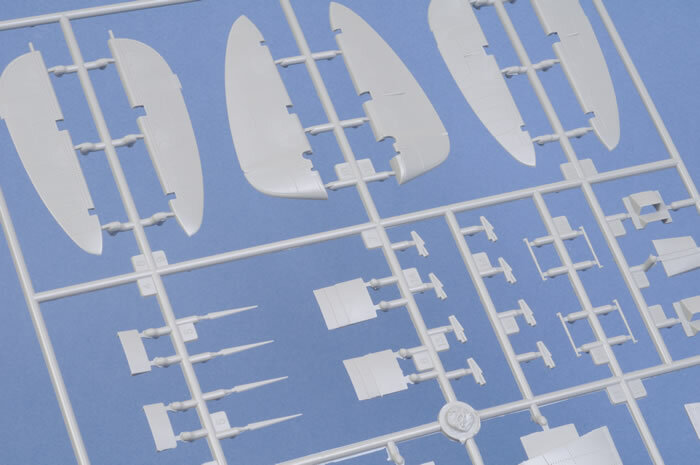 Gone are the gimmicky features that complicated some earlier releases such as hinged, workable control surfaces. 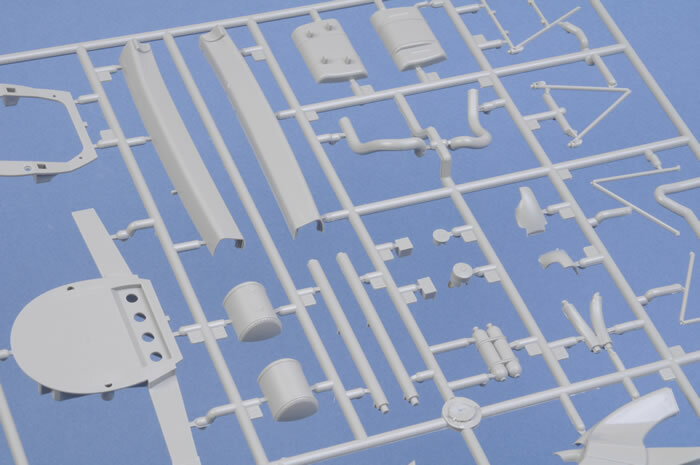 There are a few issues that the modeller can correct with relative ease. 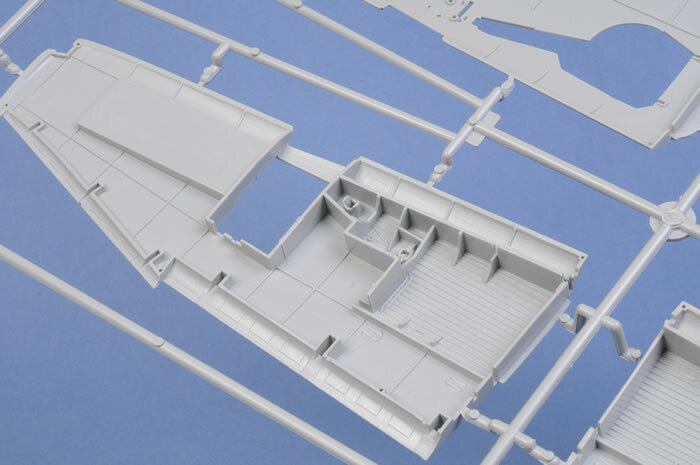 The corrugated cockpit floor might be replaced with sections of flat plastic card. 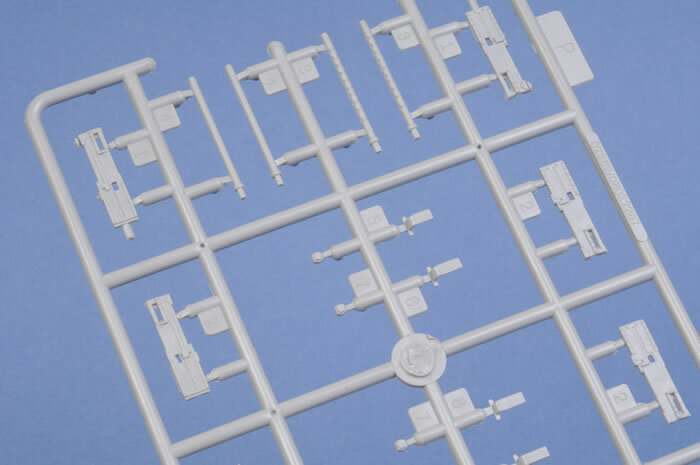 The machine gun barrels can be cut off and blast tubes added from plastic or brass tube. 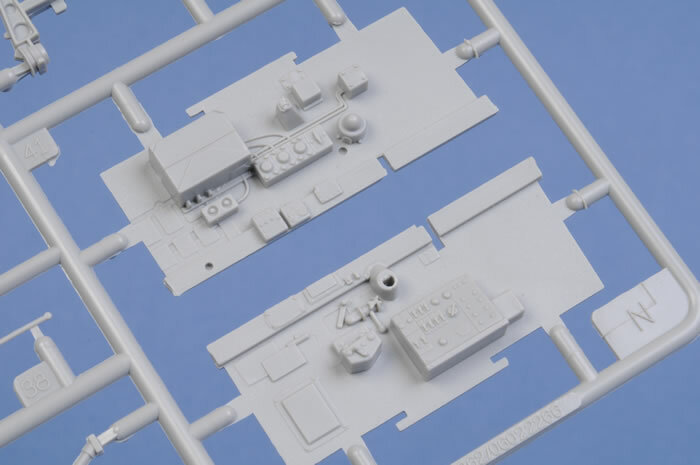 Although there are no after market canopies yet available, if you own any of the recent 1/32 scale Hasegawa Thunderbolt kits, you will have access to a spare canopy that you may be able to adapt to Trumpeter's Jug. 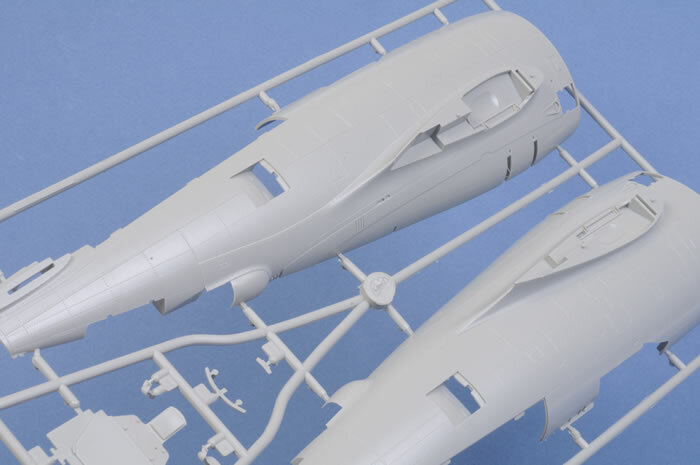 Some modellers won't like the vinyl tyres, but after market replacements are available. On this model, I think that the subtle recessed rivets will not look out of place even under a bare metal finish. Whether you adopt these suggestions of not, Trumpeter's ultimate Jug should create a big impression when completed.